In economics, the invisible hand is a metaphor used by Adam Smith (1776) to describe unintended social benefits resulting from individual actions. The reception will feature a series of short Tom Marioni-esque art actions and talks. Richards will also host an Artists Anonymous(AA) session the following Saturday, October 1, in which artists can share experiences of hitting rock bottom for art in a sympathetic environment. (Booze will be provided.) An Open House will take place as a closing on October 5th, allowing the public to utilize the space for their own art before the gallery is sanctified into the institution we love. This work draws from a series of Ryder’s previous projects: Redaction of Labor, Redaction of Labor II, Le Bore, and a few others such as The Cube and Presently Bored. 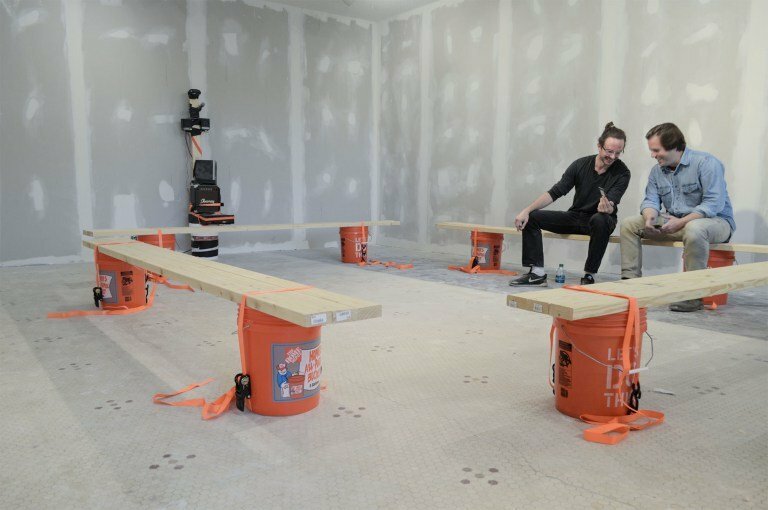 During the middle of construction Ryder held an Artists Anonymous event at the gallery, inviting artists to commensurate about their art habit and subsequent struggles with their empathetic peers.